This may be one of the most often asked questions about setting up an event: how much lead time do you need prior to getting an event up, running and online to allow it to be successful? Fortunately, we can pretty reliably call out what specifically it depends on. You’ll probably find that it comes down to a few key factors. Each of these has a very real role in determining your event’s lead time. Typically setting up the platform, getting things rolling, setting up graphics, making choices on scheduling, etc. don’t impact your production timelines, especially not in a “critical path” kind of way, to any significant extent. It’s usually these other areas that really deserve your planning and attention. If your audience is a closed audience, like an internal meeting or presentations where your staff is compelled or expected to attend, you don’t have many hurdles here. On the other hand, if you’re in a position where you need to market to outside people to help them become registered and attend, you have more time requirements. Typically we suggest about 60-90 days for externally marketing events. What’s aggravating about all of this is that you won’t be taking registrations that whole time, but you will be talking to your audience, explaining about your event and pointing them to your micro-site. This is where it’s key to have solid information on the site about sessions, speakers, what they expect from the event as an attendee, etc. The maddening truth is that most people will register at the last possible minute. You can help people decide by using contests (those registered before X date are eligible for…) and by having a complete site, but the fact is, most will register as late as possible. If you’ve worked on any type of event where you were working with speakers, you know: speakers are busy, busy folks. You need to plan on providing as much information, guidance and scheduling deadlines as you can. This is critical so they know all of what they need to know in order to participate, produce the session materials, etc. Any type of delay to get additional information, or any additional steps, and you will quickly find it escalates into delays getting their content. Respect your speakers. Give them templates, help them understand both what is needed and how you’ll support them. 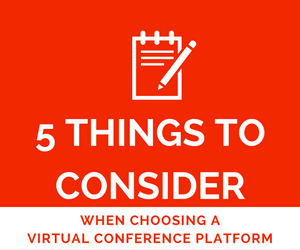 If possible, have them work with someone directly on the event team or on the platform team as they can quickly answer questions and keep the speaker moving forward. One caveat – if your speakers are internal and you have more “control” over them, you can shorten times to deliver content. The longer timeframes come from speakers that are either volunteer or paid presenters for your event. They typically are pushed in many directions constantly and you are at their mercy when it comes to getting materials in. Be sure you provide them as many resources and guidance as possible to keep them “in the flow.” For internal speakers, many times this is a much easier process. You often have leverage to set deadlines and present other requirements. Exhibitors present an interesting challenge for scheduling. You need/want them for your event, whether they are external to your company or an internal department. At the same time, they need similar assistance as your speakers do. Many times exhibitors are working with many different areas of their own companies to provide materials. They may have PDF documents, graphics, videos and people to coordinate and they’ll look to you for guidance on setting up the booth, providing information to attendees and selecting the right packages for sponsorships. This (again) is a great time to get your platform provider involved and working with your sponsors. Get as much assistance as possible so your exhibitors can make the most of their booth. Often, exhibitors are so busy just doing business that they put off the setup of the booth to the last-minute. If you, or the team you work with, can provide them quick choices, best practices and assistance, you can help vastly shorten the time to set up the booth, get it online and have it be excellent for the exhibitors. Taking control and specifically addressing each of these areas can help control your timelines, your surprises and best of all, keep you sane in setting up the event. Make sure you have a good vendor partner that can provide the help, best practices, tips and ideas to make each of these areas flow as smoothly as possible. If you make it your goal to remove obstacles and provide unique and helpful input to each of these areas, you’ll take big steps toward having a great event and still maintaining your sanity. Your attendees, speakers and exhibitors will thank you, as will your stakeholders in the event.